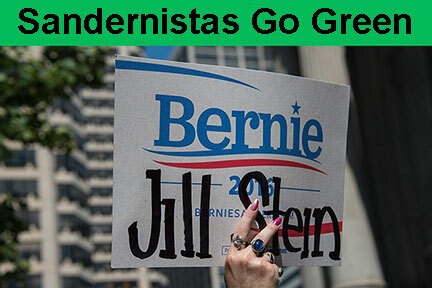 Supporters of Green Party candidate Jill Stein appealed to supporters of Democratic Party “socialist” Bernie Sanders at Democratic National Convention in Philadelphia in July. In the final stretch of this “election from hell,” the crisis of U.S. capitalism’s political system is so glaringly evident that it has become a central preoccupation of bourgeois pundits worldwide. Large numbers of youth and working people are repelled by the “choice” between two of the most unpopular and feared candidates ever. Democrat Hillary Clinton, the likely winner in November with solid ruling-class backing from Wall Street to the Pentagon and CIA, vows ramped-up imperialist brinkmanship. Donald Trump rampages as the all-purpose bigot, spewing racist venom and hatred of women, while demagogically exploiting the failed promises of “hope and change.” Clinton accuses her rival of being soft on Russia and China, while promising continuity with the Obama presidency that’s brought skyrocketing inequality, mass deportations, unending racist police terror and war. Millions of people are scared, angered and disgusted by the whole lurid face-off. For Marxist revolutionaries, massive disillusionment with the capitalist duopoly poses big opportunities and challenges to argue for the only solution to capitalism’s crisis: a workers revolution that is the only way to get at its root, the system of capitalist private property. In sharp contrast to all sorts of liberals and reformists, revolutionaries expose the farce of capitalist “democracy” as a flimsy screen for the class dictatorship of the bosses. Central to this is the baseline Marxist principle of political independence of the working class, the fight to free the working class from every form of subjugation to the politicians, parties and institutions of capitalist rule. We are doing our part. The Internationalist Group, U.S. section of the League for the Fourth International, is a revolutionary Marxist organization with locals in New York City, Los Angeles and Portland, Oregon. 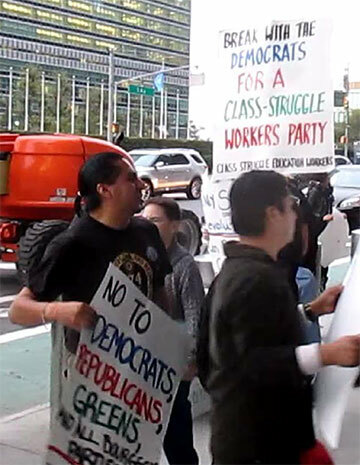 In August, activists of Class Struggle Workers – Portland, politically supported by the IG, won a unanimous vote at the membership meeting of the painters and drywall finishers union, IUPAT Local 10, for a resolution opposing “the Democrats, Republicans, or any bosses’ parties or politicians” and “call[ing] on the labor movement to break from the Democratic Party, and build a class-struggle workers party.” We call for other unions to adopt this resolution, which poses a sharp break from the subordination to the Democratic Party which has chained labor’s power for decades. In 2008, when “millennials” were swept up in the enthusiasm for Barack Obama, the opportunists joined the cheers. As is so often the case, the ISO set the tone, blazoning “Yes We Can” on the cover of its journal and plastering NYC’s Hunter College with posters bearing the new Democratic president’s catchphrase (see “Yesterday’s ‘Obama Socialists,’ Today’s Bernie Boosters,” The Internationalist No. 42, January-February 20162 ). When the ravages of economic crisis under Obama gave rise to Occupy Wall Street, the whole “left” confraternity adopted the vocabulary of Occupy. With mind-numbing uniformity they called for a “party of the 99%,” ever-new “movements of the 99%,” and other formulas in which the concept of class struggle was blotted out by the classless rhetoric of populism, which reflects and reproduces the bourgeois ideology of “we the people” and American nationalism. When Occupy fizzled, these opportunists for whom tailism is a political way of life were bereft for a time – but then came “Bernie.” Senator Sanders spun the tropes of Occupy into a populistic campaign for a purported “political revolution” within the governing party of U.S. imperialism. The Internationalist Group stated clearly and unequivocally that “the central political function of the Sanders campaign is to round up votes from disaffected voters, keep them in the Democratic fold, and deliver them to the eventual nominee” (“Bernie Sanders and the Pressure Politics of the Opportunist Left,” The Internationalist No. 43, May-June 20153 ). That is, of course, exactly what happened. Yet the spectrum of social-democratic and Stalinist leftists scrambled to cash in on Sanders’ popularity, hailing him as a fellow “socialist” and pleading with him to run as an “independent” candidate while differing only in the degree of shamelessness to display as they ran panting after his bandwagon. While Socialist Alternative staked its bets on being the most gung-ho of all, the ISO coyly feigned “principle” by demurring from an outright endorsement while breathlessly hyping the “breath of fresh air” of Sanders’ so-called “socialism.”4 Meanwhile, one of the ISO’s most prominent figures, Keeanga-Yamahtta Taylor, wrote a “Black Votes Matter” column titled “Why Hillary Clinton’s black supporters should feel the Bern” (Fusion, 23 February). When Sanders pivoted to openly stumping for Clinton, most Sandernistas were led by their held noses into the Hillary camp. 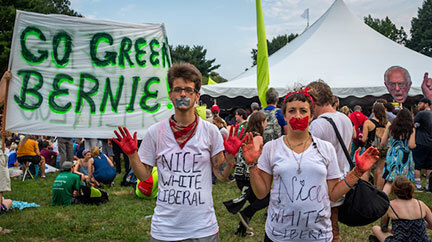 Some held out for some kind of electoral alternative, and are turning to the Green Party, which – with Sanders tirelessly huckstering votes for Hillary – is running a liberal doctor named Jill Stein for president. And, predictably, wherever the young liberal lambs go, the reformist left is sure to follow. For her part, Stein presented her campaign as “a plan B for Bernie” (NPR interview, 24 July) and called on Hill’s shill Sanders to join the Green ticket. Some “alternative”! Yet the usual characters heap praise on Stein as a “genuine left candidate” (“Build a New Party of the 99% – Support Jill Stein,” at socialistalternative,org, 15 August) and “a genuine left alternative” (“Can You Vote for What You Want in 2016?” socialistworker.org, 3 August). Liberal Greens appeal to Democrat Sanders at Philadelphia convention in July. Seriously? If you want to know what Stein and her Green Party stand for, start with their site (gp.org): it features a big picture of Democratic icon Franklin D. Roosevelt and his slogan “We have nothing to fear but fear itself.” Don’t get the picture yet? Stein’s central slogan is for a “Green New Deal.” FDR and his “New Deal coalition” are what solidified the subordination of the U.S. labor movement, African Americans, left and “progressives” to the Democratic Party of U.S. imperialism. Stein is running not as a break from Democratic Party liberalism but its legitimate continuator. As we have repeatedly noted, the Green Party is “a home for homeless Democrats” as their party turned to the right under the Clintons (Bill and Hillary). As former Georgia Democratic Congresswoman Cynthia McKinney, the Greens’ presidential candidate in 2008, stated: “I had a place to go when the Democratic Party left me” (see “Socialists in Bourgeois Electionland,” The Internationalist No. 28, March-April 2009). November 20085 ). So in calling for votes to the Green Party, the ISO is seeking to pressure the Democratic Party from the left. Logically enough from its standpoint, the ISO has run candidates on the Green ticket, notably in New York and California. From Bernie to Jill: Social democrats back one capitalist candidate after another. 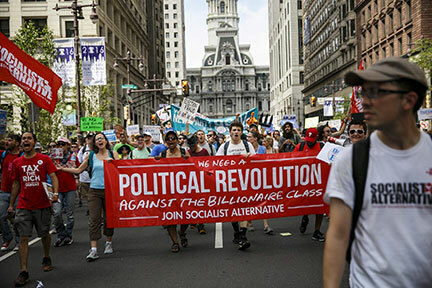 Socialist Alternative marches during Democratic convention in Philadelphia. A third party does not just “lure voters to the polls,” the Green site notes, they can “force the two major parties to adopt various policies.” It cites the Progressive Party of arch-imperialist Teddy Roosevelt, which in 1912 “helped the Democrats wrest the White House from 20 years of unchallenged Republican supremacy.” What this underlines is the point we have often made, that the Greens are just one in a long procession of thoroughly bourgeois third parties seeking a niche in a set-up dominated by the big-league parties of capital. Bizarrely, and grotesquely, the site goes on about third parties providing an “emotional bridge,” citing George (“segregation forever”) Wallace’s racist 1968 presidential campaign as an example! The Green platform provides a potpourri of proposals to “fix” the unfixable capitalist system. Having nothing to do with socialism or working-class politics (the working class is entirely invisible in the platform), this is an insipid list of liberal nostrums, hobby-horses and suggestions for the prettification of capitalist society. “Ecology” is presented as a recipe for a backward-looking “decentralized” capitalism – whereas the only way to address the environmental destruction caused by capitalism is by its revolutionary expropriation and an internationally planned socialist economy. On the burning question of racist police terror, the Green platform states with willful vagueness: “We favor strong measures to combat official racism in the forms of police brutality directed against people of color.” As good liberals, they most certainly do not point out that the whole apparatus of racist capitalist repression must be smashed; that only revolution can bring justice, as the well-known Internationalist chant insists. Typically for this kind of political formation, the Green platform calls to reduce the military budget by 50%. That would leave $300 billion per year for U.S. imperialism’s war machine. The platform endorses “humanitarian” intervention by the United Nations, stating, “The U.S. is obligated to render military assistance or service under U.N. command to enforce U.N. Security Council resolutions.” U.N. Security Council resolutions provided the fig leaf for launching U.S. imperialism’s genocidal war against Korea in 1950, and currently it is the cover for the imperialist occupation of Haiti, among innumerable other imperialist crimes through the years. The Greens are a worldwide phenomenon, but as a collection of nationally focused bourgeois reformers, the “Global Greens” is a ceremonial confederation of parties. The Green parties share their political origins in radical middle-class protest. That these are bourgeois parties is shown not only in their platform and orientation, but in their actions when they get a bit of power. If you want to know where the Green Party would go if it made it into the big leagues, just look at the German Greens, which provided the ideological cover for the 1999 NATO war on Yugoslavia. U.S. Greens disclaim responsibility for their European colleagues’ participation in war cabinets, but the fact is that where Green parties have made it in bourgeois politics they have become junior partners in administering what they view as “our” capitalist states. Currently the ISO is hailing the Green Party’s Platform Amendment 835, passed as the Greens’ convention in August, as supposedly “making the Greens an explicitly anti-capitalist party.” The amendment calls for “decentralization of power” while condemning the “old models” of capitalism and “state socialism” (a standard Cold War phrase aimed at equating the bureaucratically deformed workers states under Stalinism with the revolutionary expropriation of the bourgeoisie by the Russian Revolution led by Lenin and Trotsky). Anti-capitalist? Who are they kidding? The Green Party platform calls to “re-design corporations to serve our society, democracy and the environment,” to “change the legal design of corporations so that they generate profits, but not at the expense of the environment, human rights,” and so on and so forth. This cretinous liberal idyll of nice corporations and a decentralized bourgeois state “for the people” is the opposite of Marxism’s proletarian class program for smashing capitalist class rule, seizing the means of production and centrally planning the economy to meet humanity’s needs worldwide through the proletarian democracy of workers councils (the dictatorship of the proletariat). So after their doomed spring fling with de facto Democrat Bernie Sanders, the larger left opportunist groups returned to an old flame, the Green Party. What of the rest? Though their various campaigns are devoid of anything approaching a revolutionary program, they all share a laundry list of demands to reform capitalism. This year, seeking to cash in on the massive discontent with Democrats and Republicans, quite a few of the reformist outfits are presenting presidential candidates, among them the Party for Socialism and Liberation (PSL), Socialist Action (SA) with support from the Freedom Socialist Party (FSP), Socialist Equality Party (SEP), Socialist Workers Party (SWP). Reading these reformist election platforms with their low-level electoral appeals is enough to drive any genuine Marxist to distraction, or to fall asleep out of boredom. Certainly none deserves a vote from class-conscious workers or revolutionary-minded youth. By and large they share election planks of liberal/reformist calls on the capitalist state to fix things up. Their wish lists include enacting full employment through public works (naturally no mention of workers control, as called for in Trotsky’s Transitional Program). Instead of fighting for the expropriation of capital through socialist revolution, they tout “publicly owned enterprises.” Health care for all, housing for all, education for all round out their lists, yet there is no mention that all of this cannot be accomplished without overthrowing the capitalist system. In response to the racist police murders there are calls to “jail the killer cops,” for “community control of the police,” to “disarm the police” or even “abolish the police,” as well as calls for “abolition of the U.S. war machine,” to “abolish the war on terror” and “abolish imperialism” – all presented as calls on the present capitalist state. This flies in the face of the Marxist understanding that the bourgeoisie will never surrender its state apparatus of repression, which is vital to maintaining its class rule. What’s required is a program for the working class to smash that state in a socialist revolution and set up its own workers state that expropriates the capitalist class and helps spread proletarian power worldwide. The alphabet soup includes some particularly absurd and indigestible ingredients. The PSL’s gimmick is to propose amendments to the capitalist U.S. Constitution. Meanwhile, its ANSWER Coalition echoes Bernie Sanders’ rhetoric and tips the hat to those “voting for third-party candidates” in an appeal for an Inauguration Day protest, stating: “All of us organizing together can expand the existing grassroots movements for social change and a real political revolution.” Others range from cookie-cutter reformism to the SWP’s increasingly eccentric blend of Castroism and social democracy, and the downright sinister SEP with its propaganda against unions and systematic minimization of the reality of black oppression. The Workers World Party (WWP) has a somewhat more leftist program on sale this time around, saying “We are running to expose the election” and even calling for socialist revolution. But it’s all in the service of pressure politics as shown in their articles on protests over the police murder of Keith Lamont Scott in Charlotte, North Carolina. Under a subhead “Taking on state by pressuring ruling class” WWP argues that “the capitalist ruling class can be forced to tell their servants to pull back” (Workers World, 13 October). And do not forget the WWP’s long record of tailing after “progressive” Democratic politicians, particularly black Democrats, from Jesse Jackson to Barack Obama. When support for Obama was at high tide, the WWP hailed “the millions who took to the streets in celebration of an historic event” (Workers World, 13 November 2008) and joined in “Harlem’s joy over President-elect Obama” (13 November 2008).